What are your responsibilities regarding your employee’s mental health? Mike King was recently awarded New Zealander of the Year for his work campaigning on mental health issues in New Zealand. Over the last few years, there has been an increase in conversations around mental health, and the role employers and workplaces must play in the mental health of their employees. We have also seen legislation updates focus on this more. And it’s not surprising. Mental illnesses are common in New Zealand, with figures from the Ministry of Health in 2006 showing one in five people aged over 16 suffer some form of common mental illness in any year. In December 2018, a senior social worker at Oranga Tamariki-Ministry for Children attempted suicide and suffered two sensory strokes. The worker claimed this was due to extensive bullying and sexual harassment in the workplace, which she had reported and said nothing was done. News presenter, Greg Boyed, committed suicide in August 2018. His family said Greg suffered from depression. The Ministry of Justice released figures in August 2018, showing 668 people committing ‘death by suicide’ in New Zealand in the last year – the highest level since records began. Around half of all homicides in New Zealand are committed by someone who is identified as family, with police attending a family violence incident every 5 minutes in 2016. Under the Health and Safety at Work Act 2015, employers must take reasonably practical steps to eliminate or minimise risks to their employee’s health, both physical and mental, and prevent harm at work. They must ensure the workplace doesn’t cause a risk to the employee’s mental health, including psychological harm, commonly caused by bullying and/or harassment and stress. At the same time, the Human Rights Act 1993, prohibits discrimination against people on the grounds of psychological disability or impairment, psychiatric illness and experience of mental illness, or mental health problems. This includes current employees and those being recruited. The Domestic Violence – Victim’s Protection Act 2018 highlights the impact that domestic or family violence has in the workplace, acknowledging that family violence doesn’t stay at home and placing new responsibilities on employers. The Act also bring into play another area of workplace discrimination, saying it is unlawful for an employer in the context of employment (including an application for employment) to treat adversely, or to make an implied or overt threat to treat adversely a person, on the grounds that the person is, or is suspected, assumed or believed to be, a person affected by domestic violence. Family violence can impact the employee at work, both mentally and physically, so is a potential risk to health and safety itself. WorkSafe NZ CEO Nicola Rosie has indicated that WorkSafe will now look to start prosecuting in relation to mental harm, employers have to make sure they actively prevent physical and mental harm from occurring. At the same time, employers need to do so in a way that doesn’t unlawfully discriminate against their employees – having a workplace policy to manage this, is just not enough. Acknowledging that bullying, harassment, stress and domestic violence are real risks to health and safety in the workplace, and then preventing and managing these hazards, is a good starting point for employers. Staff must be made aware of these hazards and feel comfortable raising all health and safety concerns with their employer, including mental health concerns. Company culture is critical here; employees must feel safe to report their concerns and know the employer will respond effectively. If not, managing the potential harm will not be easy for an employer. At the same time, employers must ensure their managers are trained in responding to, and handling, mental health concerns and that support is provided. Supporting an employee when they’re suffering from mental health issues simply as a protection from being prosecuted isn’t the only benefit to employers. A Southern Cross Health Society “Wellness in the Workplace – Survey Report 2015” shows that workplace cultures that value employee wellbeing are linked to having the strongest productivity, whilst Price Waterhouse Coopers’ report “Creating a mentally healthy workplace” found that, on average, every dollar spent to promote good mental health in the workplace reaped a return of $2.50. Higher levels of psychological wellbeing and employee engagement are also linked to better performance, productivity, customer satisfaction and organisational citizenship. Whilst the costs from low levels of mental wellbeing at work include absenteeism, presenteeism (being at work while feeling unwell), reduced work performance, increased turnover rates, higher accident and injury rates, higher health care costs, higher worker compensation premiums, poorer organisational citizenship behaviours and greater counter productive work behaviours. We’re here to help. 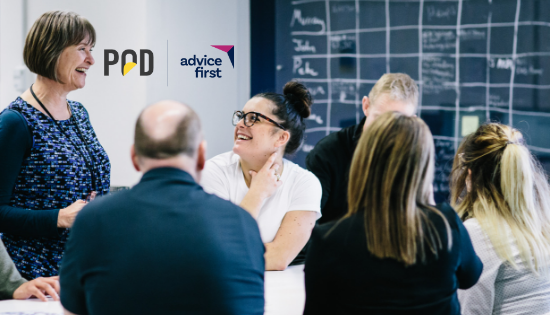 At POD | AdviceFirst we can assist you with developing relevant policies to support your employees, whilst meeting your legal obligations. We can also offer advice on additional points you may wish to consider, how to respond to concerns raised by employees and point you in the right direction to access support services for your employees. You can learn more about your obligations and get better equipped on how to support your employees at our upcoming workshop on Mental Health.